We’ve all been coached. Parents, teachers, and mentors guided, supported, and held us accountable as we grew and learned and honed various life skills. But, who helps us with parenthood, our most significant life journey? YOU are your baby’s first teacher, no matter how exciting or scary that sounds. And baby’s job during the first year is to learn to move! Imagine feeling at peace, knowing your baby is on track. Picture a development expert at your fingertips, helping you and baby. I, as “Your Baby’s First Coach,” will address your questions and concerns, teach essential pieces of the puzzle you had no idea existed, and hone your skills: handling, care-taking, playing, and connecting with your baby. And, as a member of your team, I will ensure your baby starts with the strongest foundation for a healthy, happy, and thriving future. Read more in the description below. Who helps us with parenthood, our most significant life journey? We do the best we can: repeating or avoiding what our parents did, reading books and blogs, listening to podcasts, getting advice from EVERYONE, and jumping down the Google rabbit hole. Sometimes we find what works, but often we don’t know what we don’t know and we are left questioning: “Am I missing something?” “Am I doing enough?” “Am I doing the right thing?” Confusion, frustration, exhaustion. White-knuckling to barely survive. No matter how you feel, YOU are your baby’s first teacher. Exciting, scary or both, you are leading in partnership with your baby as they develop and you both learn and grow. Your baby’s job is to learn to move, because EVERYTHING requires movement. Your job is to support that journey. Movement creates opportunities for interaction, connection, and engagement. Mastering movement opens doors to development because baby can navigate, explore, discover and learn. 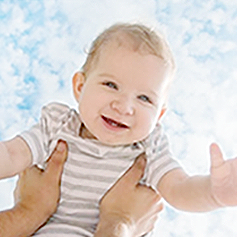 Your baby’s first smile, first reach, and first coos melt your heart. Clapping, waving, rolling, crawling, standing and taking those first steps. Magic! The brain and body grow faster in the first year than at any other time. When we show up with love and provide the experiences baby needs, they thrive. When you take the extra step to understand movement, what helps it and what hinders it, you are building the strongest foundation for your baby. You are maximizing the effects of a year you won’t get to repeat; one where they go from completely dependent to independently toddling around. Movement is key to proper body and brain development. How we interact, play, and care for our babies will determine the strength of that foundation. Shifting the way you show up and tweaking the way you do things (not adding things to the day) makes all the difference. It’s simple, but not always easy. The first year is exhilarating and challenging. It’s not just baby’s journey; it’s yours too. Grow joyfully and with confidence as you travel your path together, with guidance, support, and love. Movement skills, interactions, and connections are built little by little, every day. These skills are grounded in your interactions during the daily routines: feeding, care-taking, playing, conversing, handling, outings, and routines. As your baby grows, the way you do these tasks will change, but your connections continue to get deeper and stronger. As your baby grows, information processing is more comprehensive. Baby learns and makes more sense of self, others, and the world. As your baby moves and explores, you have a window to baby’s thoughts and feelings. An eye gaze, a smile, a reach for your nose, or a roll to get a favorite toy: when you take the time to be present and observe, you learn so much about who your baby is and where she is going. Wouldn’t it be great to understand and nurture with confidence the development and growth happening in front of your eyes? It’s not about doing more things; it’s about doing things differently. Baby is on this journey with you, not in isolation. What you value, understand, and expect from your baby influences her experiences and potential. Wouldn’t it be great to know more so you can feel more confident, less stressed and worried, and happier because you’re on the right path? We are all in this together. The journey is far more fun and fulfilling in a community where we learn together and support one another. That’s why I created “Your Baby’s First Coach.” I want to be here for you and your baby. I want to help you reach for the stars, starting day ONE! I want you, not just to survive the first year, but to LOVE it, to thrive in it and to KNOW that what you accomplished in year ONE will be carried forward in everything that comes next. I would love the opportunity to talk with you, to work with you, to be a member of your team. Let’s do this together! Contact me through my website or Schedule a call to speak with me directly. I’m excited and honored to be a part of your journey!